I recently made sauce for ribs and one of the featured ingredients was molasses. 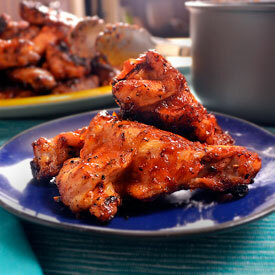 I thought it provided a great flavor and decided to incorporate it into a sauce for chicken wings. quarter cup of butter. 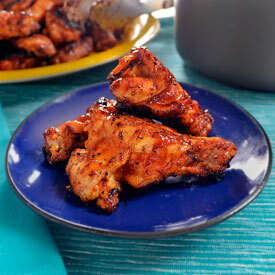 I use butter because that is what I use to thin out Frank’s Redhot when I make traditional wings. Next, I add all the barbecue sauce elements plus the Frank’s Redhot. The molasses is the sweet that cuts the heat and balances the vinegar. It also has a distinct flavor that is really the signature here. 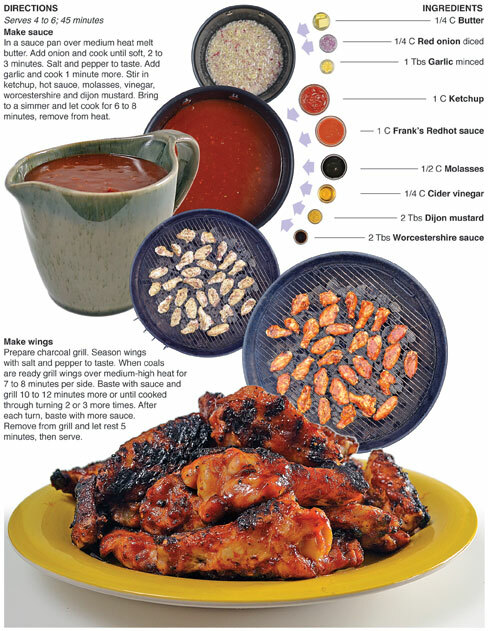 The Redhot is present in the flavor, but the molasses adds depth and really brings the whole thing together. The sauce is delicious but if I were to make it again I would add either two tablespoons of honey or brown sugar. The molasses has a slightly bitter aftertaste and I think an extra sweetener would eliminate that. That is just me being really critical of my work though, this sauce works and will be a hit at the dinner table. This is my second wing recipe in a row. I have been grilling like a madman lately and really enjoying some summer cuisine. Last year we had record heat in March and by April summer was in full swing. By this time a year ago I was already burned out on summer grilling. This year, it seemed as though summer would never get here. I got a late start, but I’m in full-swing now. I’m going grill crazy because it won’t be long and all the home gardens in our area will be churning out fresh veggies. Then I'll have enough tomatoes and cucumbers to feed a small city and grill crazy will turn to garden crazy. In a sauce pan over medium heat melt butter. Add onion and cook until soft, 2 to 3 minutes. Salt and pepper to taste. Add garlic and cook 1 minute more. Stir in ketchup, hot sauce, molasses, vinegar, worcestershire and dijon mustard. Bring to a simmer and let cook for 6 to 8 minutes, remove from heat. Prepare charcoal grill. Season wings with salt and pepper to taste. 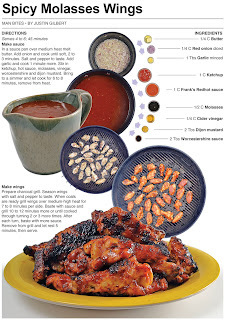 When coals are ready grill wings over medium-high heat for 7 to 8 minutes per side. Baste with sauce and grill 10 to 12 minutes more or until cooked through turning 2 or 3 more times. After each turn, baste with more sauce. Remove from grill and let rest 5 minutes, then serve.